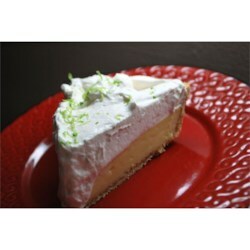 "A very refreshing, easy Florida specialty pie!" Preheat oven to 250 degrees F (125 degrees C). In a large glass or metal bowl, beat egg whites until stiff peaks form. Set aside. In a medium bowl, beat egg yolks, then stir in condensed milk, lime rind, and lime juice. Mix well, then fold mixture into beaten egg whites. Pour mixture into graham cracker crust. Bake in preheated oven for 10 minutes. Chill before serving. Garnish with whipped topping if desired. This is the best key lime recipe I've ever made. The others are too custard tasting but this one, allows you to really enjoy the lime taste with the unique texture. Truly awesome!